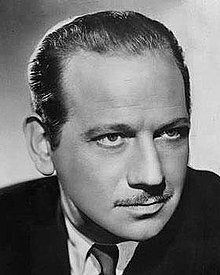 ملوین داقلاس (اینگیلیسجه: Melvyn Douglas) آمریکالی موغنی و اوْیونچو. ۵ آوریل ۱۹۰۱ ایلینده دۆنیایا گؤز آچیب. ۸۰ ایل عؤمر ائله‌ییب و ۴ اوت ۱۹۸۱ میلادی تاریخینده وفات ائدیب. 1927–1981 ایللر آراسیندا سینما ساحه‌سینده چالیشیب. 1949 The Philco-Goodyear Television Playhouse Richard Gordon episodes "The Five Lives of Richard Gordon"
1950 Lux Video Theatre James Strickland episode "To Thine Own Self"
1952 Celanese Theatre Archduke Rudolph von Habsburg episode "Reunion in Vienna"
1955 The Ford Television Theatre George Manners episode "Letters Marked Personal"
1960 Sunday Showcase Mark Twain episode "Our American Heritage: Shadow of a Soldier"
1963 Ben Casey Burton Strang episode "Rage Against the Dying Light"
Bob Hope Presents the Chrysler Theatre Pat Konke episode "A Killing at Sundial"
1966 The Fugitive Mark Ryder episode "The 2130"
1967 CBS Playhouse Peter Schermann episode "Do Not Go Gentle Into That Good Night"
1972 Circle of Fear Grandpa episode "House of Evil"
1977 ABC Weekend Special Grandpa Doc episode "Portrait of Grandpa Doc"
اینگیلیسجه ویکی‌پدیاسی‌نین ایشلدنلری طرفیندن یارانمیش«Melvyn Douglas»، مقاله‌سیندن گؤتورولوبدور. ( ۲۲ ژانویه ۲۰۱۸ تاریخینده یوْخلانیلیبدیر). قارداش پروژه‌لرده ملوین داقلاس گؤره داها آرتیق بیلگی‌لر تاپابیلرسینیز.